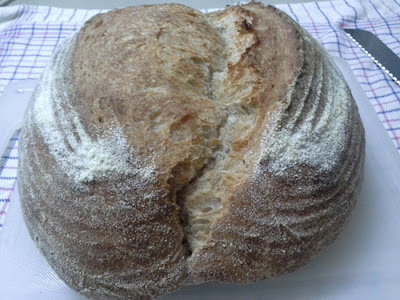 This month Zorra of Bread Baking Day asked Susanne of Magentratzerl to be the host for BBD #84. Susanne came up with the theme "sandwich bread". I have to admit at first I had no idea what sandwich bread was. It's bread that can be roasted and is good for sandwiches. That sounds like good bread to me. 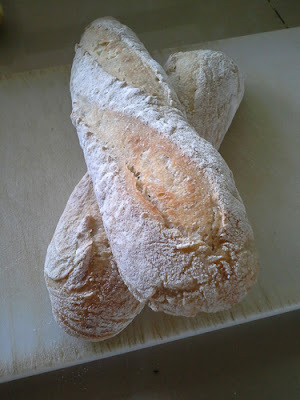 Today I make Dan Lepard’s crusty Potato Bread. The original recipe is found in his book “The Handmade Loaf”. 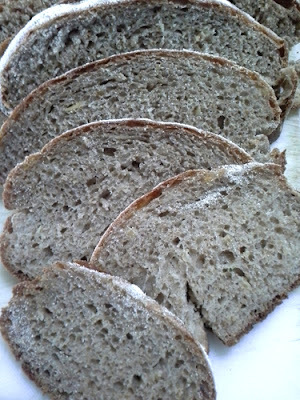 I’ve tweaked it a bit, using whole wheat bran, rye and I love the smell and taste of wheat germ. Because of the grated potato the dough was wet. I used the mixing method from Maggie Glezer’s Royal Tortano and let it mix until the dough cleaned the bowl. This took about 10 minutes. I could almost pour it into the slightly oiled bowl. But it was tacky in stead of sticky, a good thing. cast iron pans; most Thai food is stir fried over high heat. and traveled in a backpack to our kitchen. When we came home from our yearly trip to the Netherlands I had a quick look at Zorra's page Kochtopf to see what type of bread we were asked to bake for Bread Baking Day 83. Zorra came up with the idea of baking with special flours. Since I don't have access to the special flours like emmer, buckwheat, kamut or einkorn Zorra mentions in her post I was happy to see rice flour. We have plenty of rice flour here in Thailand. But, what can I bake with rice flour? After a good look in my long list of "breads I want to bake" I saw a recipe by TXFarmer. She baked delicious looking baguettes and added some rice flour after a trip to South East Asia. Before we left for the Netherlands I dried my starter and revived it in just a few days! I'm so happy with "my" Lievito Madre. I'm using for this one a few years already. Even though I'm baking bread for some years now, I'm still not very good at shaping baguette. I let the bulk rise go too long (because of the high temperature) it showed beautiful big bubbles, but this makes it very hard to shape into a good looking baguette. There is only 50 grams of rice flour in the dough, but it still makes a difference in taste. I was happy with the result and the baguette tasted delicious. 5 years ago I baked my first kind of Povitica. We visited Peter’s daughter, Nieke and her husband Miron and our granddaughter Stella (now she has a sister Emma). There we met Visnja, Nieke’s Croatian mother in law. We talked about baking bread and she told me about Povitica (poh-vee-TEET-sah) Croatian walnut bread. She told me that her father loved this bread, but her mother couldn't bake it. I told her I would (try to) bake it for them. Because we can’t give them the real bread, since they are in Holland and we are here in Thailand we will share it with friends. This way, more people will enjoy this Croatian Povitica. 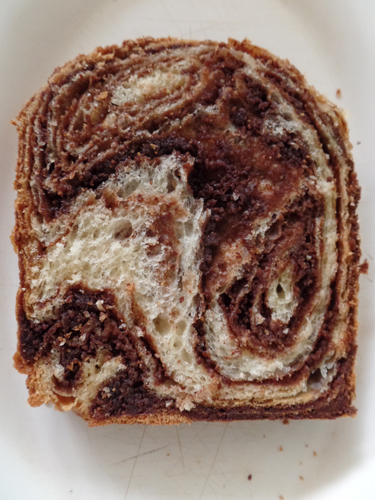 Povitica means "to roll" or "to wrap". My first Povitica was NOT a success. 5 years ago I could find 1 recipe on Internet. 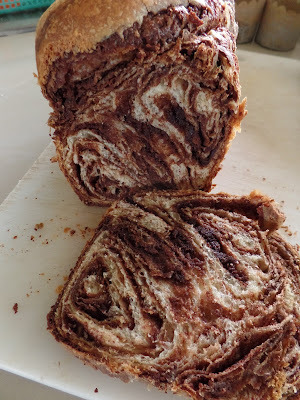 The recipe was not clear and I had no idea how Povitica should look like. Today it's completely different. Internet is filled with recipes for Povitica. It was on tv too. The contestants of The British Bake Off baked it. I used Paul Hollywood's recipe and it worked good for me. Today I made it again. Next month we are going to the Netherlands again to visit our family and friends. Thinking of them helped me to choose bread to bake for Bread Baking Day #81 with the theme: Breads from all over the world. Sandra of Snuggs Kitchen is the lovely host for this month's BBD. Povitica, this sweet or savory pastry is made with yeast-raised dough that is rolled or stretched out thinly and then spread with a filling. It is then rolled up jellyroll-style and baked variously as a log, in a crescent shape, in a loaf pan or in a Bundt pan. Finely ground walnuts sweetened with honey or sugar is the traditional filling and that's why many people refer to these pastries as nut rolls. It's delicious, festive looking, great smelling and ready to eat bread. And it's really fun to make. I will make this again. (*) I followed Paul's recipe, except for the sugar. I try to avoid sugar. But baking sweet bread asks for sugar or a sweet substitute. I grounded granulated organic sugar for the dough, because the size of the granules has an effect on the dough and the outcome of the bread. Since this doesn't apply for the filling I used natural sugar. In Thailand we have a lot of coconut sugar and cane sugar. I'm not saying this is better or healthy sugar. It's still sugar, but for me less bad then refined sugar.